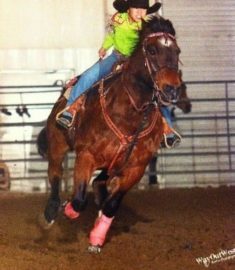 My horse, Hi Performance Jack, is a great horse and a member of the family. Hi led me, Denim Goff, and my Aunt Eleesha Boone, to many victories. He is a very amazing horse with a huge heart! I can remember the first time I rode him in 2007! He was 26 and I was 3. He helped me by giving me great confidence. In 2011, we won the 8 and under NJRA Barrel Racing Championship! I was able to ride him about 6 years before he was retired permanently. Hi has been a part of our family since he was born. My grandfather owned his dam and a neighbor owed his sire. Hi was a small horse in height, but huge in try! He even won a 2 yr. old race in our hometown. He was dead last halfway through the race, then out of nowhere came back to win it! I wish I had been there to see that. Our entire family loves Hi. He is still alive at 35. There will never be another one just like him. He will always be the most special horse in my life.